Welcome aboard the Carolina Express. It is 1965 and North Carolina is a hotbed for international espionage and intrigue. Spies are everywhere. 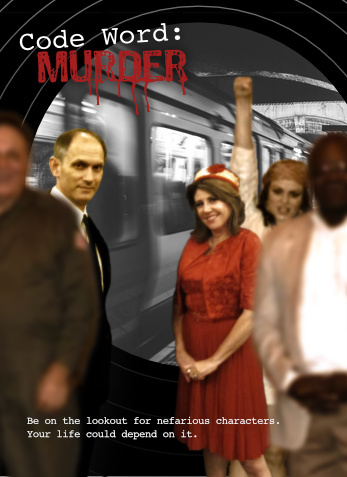 Agents like super-spy Natasha Nozdrin Jones and her equally super daughter, Oatmeela Fiberinsky Smith, along with Oatmeela’s bungling husband Boris Zinchenko are expected to make an appearance. That bickering husband and wife duo of Pepper Truelove and Avery Hunter are sure to cause a scene during our excursion, and you don’t want to miss a chance to meet former astronaut Tex Houston, who may have a few secrets of his own. One of the passengers could be the notorious head of VULTR (Villainous Underground Louses, Thugs and Rogues). Beware! You may need code words and phrases to get this bunch to talk. Memorize these, as well as other information in this dossier. Don’t let this vital information fall into enemy hands. Roses are red, I am so blue. Can't you tell, I miss you? Be on the lookout for nefarious characters. Your life could depend on it. In the event of a shocking crime, it will be up to you and your table of fellow sleuths to discover who could commit such an evil deed. So, think of a clever name for your table, er, detective agency and listen carefully for clues. At the designated time, your agency will be asked to formulate a question that your delegated chief detective will ask a suspect. Once all tables have completed their questioning, each detective agency will submit a solution sheet indicating “who done it” and why. The first agency to name the most correct motive and culprit wins. ouston, we have a problem. Tex is a former astronaut who encountered brain-scrambling stupidiation during a secret mission. He has never been the same. Is he now a space monster intent on taking over the world or will his spaced-out behavior lead to this being his final orbit? If you have a Boris Smith sculpture in your home, you are the victim of Russian eavesdropping. Boris is really a spy with a way with clay, and a knack for collecting information. He is married to Oatmeela and they live in Seagrove, NC. Is he chiseling his way to becoming a top spy, one body at a time; or has he planted his last bug? An aerospace engineering professor with secrets to hide, Avery puts his students to sleep and his enemies to rest. He is an American spy with connections. Who does he plan on eliminating tonight? Will someone throw this engineer under the train? Popular folk singer Oatmeela is a top Russian agent, (like her mother, Natasha) known for getting the job done. She is married to fellow-agent Boris. Will she snap up information while crackling the bones of her enemies? Will she consider singing pop? Is it true that her picture will soon appear on the box of a new breakfast cereal? What does your décor say about you? More importantly, what are you saying that your décor is relaying to the interior designer who created the look? Pepper uses her designs to learn valuable information. Will she include a stuffed spy in her next plan? Has she designed her final curtain? Author of Femme Fatales and Women of Mystery, My Heart Speaks with an Accent, and Orbital Relationships, Natasha is also a top Russian spy, and the mother of Oatmeela. Will her pen drip with blood tonight, or has she written her last chapter? As steel meets steel and wheels pound rails, the man responsible for your safety and comfort is Conductor Snodgrass. Will he keep this train on schedule? Will he toss some unruly passenger from the train, or has he come to the end of the line?